Nature knows how to take care of itself. When trees drop their leaves in fall, the eco system takes lead to digest and dissolve the fibers; it reuses to create anew. 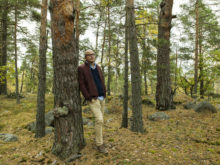 If you ask Elin Larsson, the resemblance between nature and business isn’t far fetched. She believes that nature gives us cues on how to live our lives, and how to create sustainable fashion for the future. What started as a serendipitous encounter at a Christmas party 16 years ago, where Elin Larsson was offered to come work for Filippa K instead of taking on the studies she had in mind, has turned into a well rounded career with positions in several areas of the company. Now, Elin Larsson is the company’s Sustainability Manager and one of the leading minds behind the company’s first truly sustainable styles. Elin will tell us to slow down, to think twice, and to take a step back. Yet, she will take a leap into the unknown for what she truly believes in, whether it’s climbing a mountain in the pitch dark, windsurfing, or diving headfirst into a project that an entire industry would be scared to fail in. On a cloudy Friday morning, she takes a sip of her coffee and starts telling us about it all. Nature means a lot to you. What kind of things do you do when you’re in nature? I do a lot of hiking and running, most of the time. When the right season comes, everything from windsurfing to sailing, to skiing. What do you think about when you’re alone in nature? It’s a combination. When you’re windsurfing, all alone, way out, and there’s a lot of wind, then you can become a bit scared. But it’s also so impressive to feel the power of nature and that you’re able to go in that speed! There’s only me, the little sail, and a lot of wind. It’s a combination of being a little bit scared and also thrilled about speed and power. It’s the same thing when you go diving. You get the same feeling when looking at the coral reef. All of a sudden, there can be this steep part where you go from maybe seven meters deep to, I don’t know, fifty! Then you almost can’t see the bottom. That feeling is so “aah!” (gasping), but so amazing! Family is the most important thing in my life actually. When you become a family you get a totally different perspective on life – which also makes it so much more essential to be aware of the fact that what we’re doing today will have consequences for our children’s life going forward. Also, we are quite an active family, so we try to engage the kids in all activities. They are joining us for all the things we do. You went climbing Mount Kilimanjaro together with your husband last year, just the two of you. What are some things you learned during that trip? It’s important to make sure you’re not only a mom or a dad; that you make sure to have a good relationship as a husband and wife. Our two daughters are really close in age, so there wasn’t a lot of time for taking care of each other earlier. That Kilimanjaro trip was actually the first time in a long time that we spent a few days away from our children and it was really good. I think we realized that you need to do these sort of things on your own in order to take care of the relationship. You also realize that it’s always great to do this kind of trip with someone you’re close to, amid nature. There is no electricity, mobile phones don’t really work, so there is no entertainment. There’s only you and nature, which is fantastic. You really have to see each other…do you understand what I mean? What was it like reaching the top? It was really a fight reaching the top in the middle of the night. It was totally dark, snow was falling and the way up there was long. I can’t remember exactly how many hours we actually had to walk in the dark, but I think it took us five hours or something. You have to push yourself. I thought it was going to be easier. The last climb to the summit was also really tough. It’s such a great feeling of having accomplished that challenge together. We were almost crying because it was so beautiful to see the sunrise from the summit, but also just because we were able to do that climbing. We were just really impressed by each other’s accomplishments. It was amazing and there will be more of those trips. 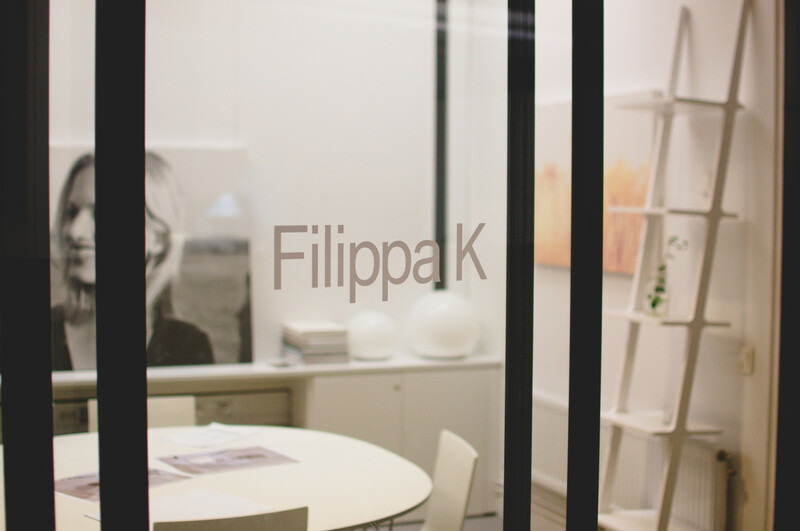 When you started at Filippa K, 16 years ago, you had no idea of what you were getting into. The same goes for those adventurous travels you have taken. Have you always been brave about entering the unknown? Both yes and no. I like to push myself, but in between those times, I like safety and knowing what’s going to happen. I like long-lasting things. When I do something, I’d rather go in deep and fight for it. So it’s both yes and no. Then there are things like windsurfing that I only started when I was older. For me, that was also one of those challenges where you start without knowing anything – but then, you get to improve yourself even though you were quite scared in the beginning. So for me, I think I’m both types: both safe and daring. They take turns. In what way is your work influenced by nature? Nature is a real inspiration to me. I really feel like nature is a retreat. You can get a lot of energy and healing by being in nature. Also, nature has been recycling and reusing for a billion years, so we can actually learn a lot from it. There’s no waste in nature. When did you first start thinking about sustainability? It’s been a journey from the very start. In the company we have actually always thought about sustainability, and made clothes that can last for a long time, but you didn’t talk about it in those terms in the beginning. Sustainability is a concept that has arisen in the last years. I would call it evolving. When times are changing, you realize that people get more and more aware. That’s where we’re now. With the rest of the team at Filippa K we wanted to explore what fashion would look like within environmental boundaries. The main ambition is to shift our business to circular models where no waste is created and we use our resources in the best way possible throughout the life cycle. This means we need to make sure the production of our clothes is completely sustainable, the whole supply chain is transparent and that we can offer sustainable ways of consuming fashion. Also, in the end, we need to make sure we get our clothes back so we can recycle them into new textile fibres. It’s an elaborate mission that we approach with lots of deep dive research and extensive analysis. We use all the learnings we gather through our daily work as we go along. We have started this deeper journey together with our suppliers and there’s still a long way to go, but we’ll get there. Where do you see fashion in the future? I believe that if you look at the industry as a whole, there will be two different paths. You will have the fast fashion and the slow fashion. What you will see is that slow fashion goes into high quality products that may be a bit more expensive, but will have a second hand value to them and last over time. Then you have the other part, where fast fashion goes into ultra fast fashion. Here, you don’t have to go through all the steps that clothes go through today. Maybe they will be made out of paper, and when you’re done with them, you will throw them in the newspaper recycling bin. That’s fine because it didn’t require lots of resources to produce them. Going forward, it doesn’t matter from what company you come from, if you haven’t transformed, you will not be able to do business. You need to change. The ones who don’t shift won’t survive. In what way does your work within Filippa K tie into this futuristic vision? Well, as I mentioned, it’s really about getting to know the whole process – from manufacturing a piece of clothing to end of life. We realized that we had to think about both the clothes we produce and how people use the clothes they’ve already bought. One part of this concept is our Front Runners jersey products which are completely recyclable: the fabrics, threads and the linings are made of Tencel, a sustainable material made out of wood, and the buttons are made of nuts. We are spending a lot of time and resources to find new methods and materials to produce garments in a sustainable way. 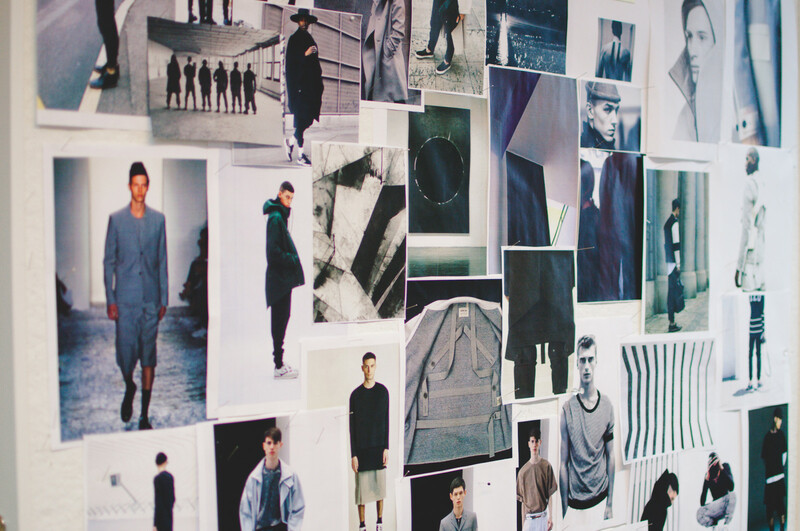 These techniques and fabrics will also be used for our main collections in the future. And how do you take care of the clothes people have already bought? That’s where the reusing and reducing comes in. Really, we don’t have to own so much! We’re trying to help people take better care of their items, instead of simply buying new things. 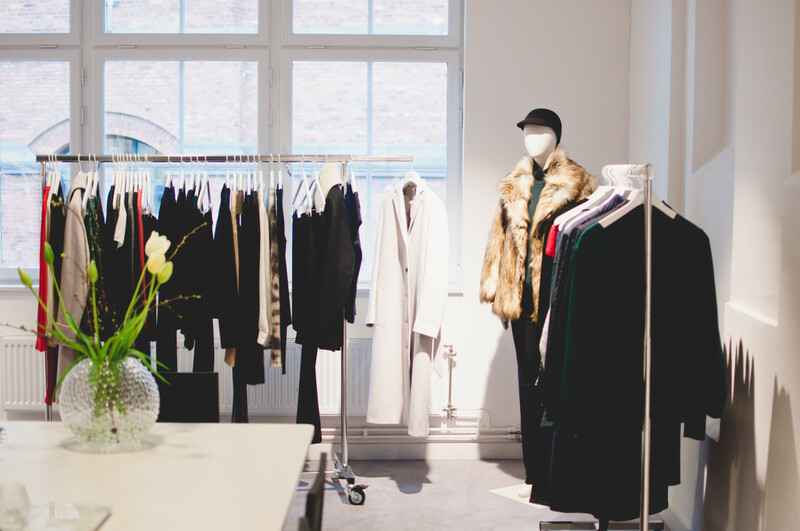 This is why we just launched Filippa K Lease, where you can rent a selected part from any collection, and Filippa K Collect, that offers customers the possibility to hand in garments and accessories for reuse. 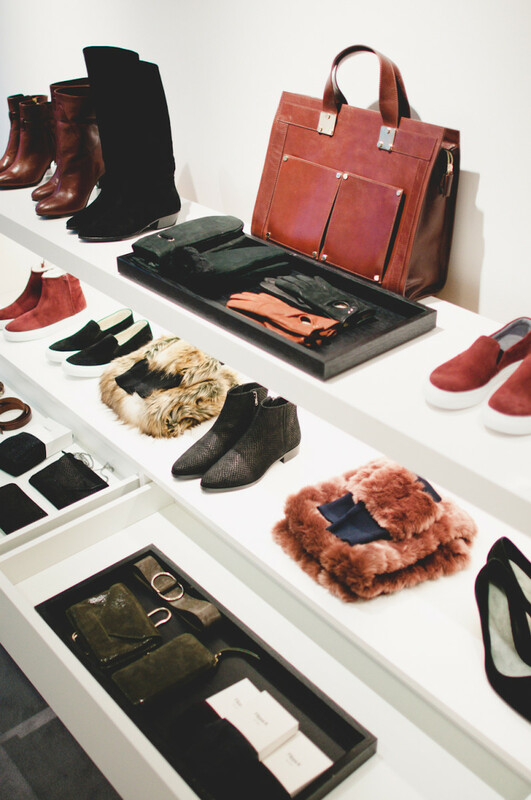 We also have the Filippa K Second Hand store. We want to develop all these concepts even further and open up in more locations as people are more positive towards new ways of consuming nowadays. Both as a way of reaching sustainability, but also, because they want to find something unique, something not everyone else is wearing. I think it’s about letting clothes tell a story. We want to be able to raise awareness of reducing and reusing. You spent the year after high school in Boston. What led you there? I worked as an au pair for a year for a fantastic family. We actually still have contact. There were this six months old girl and four year old boy that I took care of. It doesn’t always happen that you have such a success with the family and get the one that you connect with, but I had a wonderful time. The family even came to my wedding and I have visited them several times. The mother in that family actually worked for the environmental department within the state in Massachusetts. Do you think her field of work influenced you to go where you are today? I think this was the first time I met someone who actually worked with these issues. Then, the first time I listened to someone who really got me hooked was Carl Henrik Robert – the founder of Natural Step. He was really addressing how acute it is to start working with this. His words and visions are also prominent in the way I’m working with sustainability today. In what way did he influence you? I started working with Natural Step in 2008 and they helped us develop our first environmental policy – our second hand store was a result of that. Two years ago we worked on yet another project together: We took one of our best-selling products, a top made of organic cotton produced in Portugal, and tracked the whole value chain; from the cotton field to “end of life.” We did all this through a sustainable lifestyle assessment where we looked at what people really wanted out of their clothes in terms of color and durability. In addition to this, we conducted another survey where we looked into what makes certain clothes become wardrobe favorites. So that was the starting point? Exactly. This is one of our partners that has meant a lot to us – it’s important to get all our partners involved in this development in order to create change. 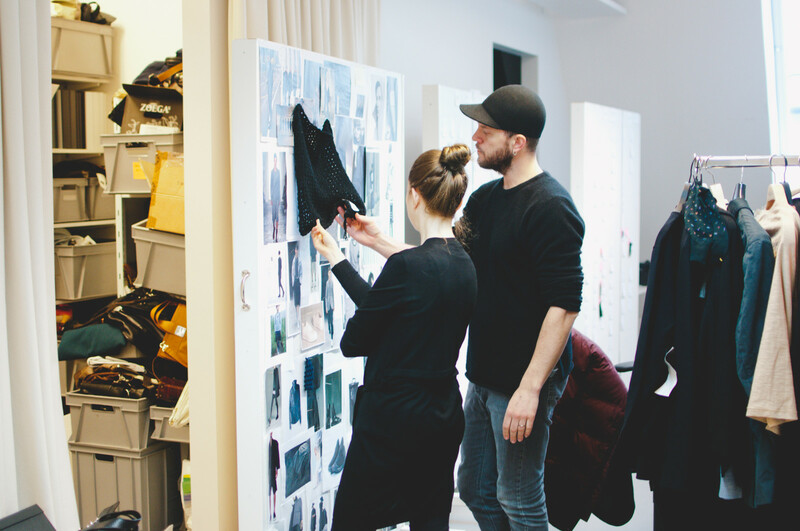 So in May last year we held a workshop in Berlin with 30 people from different suppliers, factories, social and environmental organizations as well as countries and cultures – all the discussions we held were relevant to the topic of fashion’s future. During this workshop, we set up a scenery: If this is the situation now, what would you want it to be in 2030? What would sustainability look like? What were some of those visions? The ambition is that by 2030 all our clothes should be Front Runners. And that means that the whole chain should be transparent, with sustainable suppliers, and make use of as little resources as possible. What are some bumps in the road that you’ve encountered in the process? During the research phase, it turned out that most people wanted black clothes. Those items were the ones they identified as most valuable and would keep year after year. That’s why our first Front Runners are just that: black. But we also knew that dying in black is one of the worst colors, because that’s when you use the most chemicals. After getting everyone’s perspective on the process, we tried to completely reinvent it and put lots and lots of effort into doing so. After all, the original process turned out to be more efficient. I’m really happy that we did such a deep dive research, but another side of me is sort of disappointed that we couldn’t invent something new. You practice yoga and qigong every morning. Is this how you get energy and balance into your life? When you put yourself in that position, and you think about what’s important in life, well, then you realize that it’s not about how many TVs you own or how many cars you have; it’s really about relationships. I guess yoga, qigong or whatever you use works like that. Being in nature gets you in that mood too. You know, to just feel good about yourself. It’s so easy to feel negative about yourself. Instead, find the good things and you’ll get the energy you need to move in the right direction. How do you define “the right” decision? You never really know in the moment, but I think you need to make conscious choices anyway. Sometimes they are wrong, things you do turn out wrong. But if you just stop and take time to listen to yourself when you make a decision, I think there’s a lot of gut feeling, or intuition, that can tell you in which direction to go. I’ve listened to this man who said that when it comes to ethics and moral, it might be hard to find out what’s right or what’s wrong. But if you have the mindset that all the things you do or say are things you will bring with you for the rest of your life, and you feel proud of what you’re doing or saying – then it’s probably quite a good choice. Yes, exactly, exactly! But of course, we need to allow ourselves to make mistakes. Making mistakes is usually linked to imperfection – something you’ve experienced firsthand in your work. What impact do you think the strive for perfection has on people and creativity? I think it limits us – of course I’ve had issues with this as well, and I had to work on it in order to not get caught in perfectionism. You know, the strong need to have control over everything. But in order to let creativity flow, and also get initiatives going, you need to let go of that control and allow yourself to do wrong sometimes. And those mistakes, you will learn from them! I think it’s actually a good thing, making mistakes, because it widens your experiences. I think our whole society wants to be perfect – it’s about how we work, what we do for a living. At least that’s the case in some parts of the world. Sweden is definitely one of those places where you “have to” have the perfect home, or the perfect career, or you need to wear perfect outfits. It’s a lot of pressure. That tends to stress people. It seems like reflecting over values makes a big part of your everyday life. Overview is really good and also something that we tend to forget, because we are moving so fast all the time. And when you are running fast like that, your vision gets so narrow and you kind of forget the important things. We need to slow down our lives. Elin, many thanks for sharing your reflections on sustainability in the modern society with us! It’s been a beautiful tour around the city, underlined with much food for thought. Have a look at the sustainable styles and concepts that Elin has recently worked on. Visit more creatives we’ve met in Stockholm.